After the fleet vanishes, Apollo and Starbuck become separated and are captured by different parties. Lost in space after the temporal disappearance of the fleet, Apollo and Starbuck are running low on fuel. They find on their charts that there should be an old Colonial resupply and ammo dump on a nearby planetoid. As they approach it, they are ambushed by Cylon Raiders. They manage to destroy a few of the attackers before their Vipers run out of firepower. Then Starbuck is hit and his ship is towed to a basestar where he is taken captive. Meanwhile, Apollo attempts to escape the Raiders by slingshotting around the nearby sun. His Viper is damaged by a solar flare and he crash lands on the planetoid. Setting out on foot to find the supply dump, he is ambushed by human fighters who capture him and take him to their underground guerilla base. There, he is introduced to the guerilla leader...who turns out to be a battle-scarred Commander Adama! The individual issues of this series do not have titles. I made up the titles myself, usually based on a concept or bit of dialog from the issue, although in the case of this issue, I chose the title as a play on that of the classic 1866 Russian novel Crime and Punishment by Dostoyevsky since this issue features temporal disturbance and the 1) imprisonment of Starbuck and 2) capture by rebels of Apollo. The issue opens with an entry from Apollo's combat log, describing he and Starbuck left adrift in space after the fleet and Cylon attackers vanished (at the end of "Memorial"). On page 1, Apollo's sensors show he and Starbuck are still being hit by space-time aftershocks and Starbuck reads tachyon levels off the chart. Tachyons are hypothetical particles that always travel faster than light, therefore moving backward in time according to the accepted theory of special relativity. After doing a grid by grid search of the area of space, on page 4 Starbuck remarks they've just burned up hours of fuel. Shouldn't he have "centares" as the Colonial word for "hours"? Apollo and Starbuck find a Colonial resupply and ammo dump, referred to as a q-cache, on their charts and located nearby. Apparently these are unmanned supply dumps left behind by previous expeditions to provide supplies to later Colonial ships. But how far out would these dumps be located from Colonial space? They are in another galaxy now, after all (as detailed in "The Long Patrol") or maybe even in our own Milky Way galaxy, judging from old Earth transmissions received by the fleet in "The Hand of God" and "The Infidel Basestar". Note that the fleet also discovers an old, wrecked Colonial carrier on the surface of a planet in "First Date", suggesting a region of space visited by Colonials long ago; it might be argued that carriers such as this are the ships that left behind these supply caches throughout the explored cosmos. On page 6, panel 1, the face of "Baltifer" is deliberately hard to make out in the dark coloring and small scale presented. Looking at the panel with a magnifying glass, a human-like face with red eyes can be seen. In "Acts of Defiance" we learn that Baltifer is Baltar fused with the IL-series Lucifer by Dr. Zee. On page 7, Starbuck refers to a nearby sun as a hypergiant. This is an actual term used to describe extremely bright, massive stars that are losing mass at a high rate. Apparently, the two temporal Vipers also still have standard weapons capability (in addition to the now-powerless temporal weapons) since Apollo and Starbuck blow up several Cylon Raiders on page 8 as they approach the Colonial cache, though the weapons' power runs out quickly. 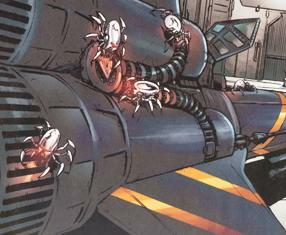 For only the third time in a BSG story, on page 10 a tractor beam is used, to capture Starbuck's Viper. On all three occasions, it is the Cylons using a tractor beam, the first being in "Doomsday Rock", the second in "The Rebirth of Cy". It's possible that the Cylons have tractor beam technology, while the Colonials do not. This is at least the third time Starbuck has been captured by the Cylons! He was first captured in "A Death in the Family" and again in "The Rebirth of Cy". On page 16, we see previously unknown, crab-like Cylon tech drones examining Starbuck's temporal Viper after its capture (in "Risk and Reward", Dr. Zee refers to them as tech spiders). Starbuck remarks to his captors that they may not want to let their drones play around with his ship, as it contains some very dangerous, unreliable, "blowing-a-hole-through-time" stuff. Is it really a good idea to advertise to your adversary what your latest, greatest secret weapons are for? On page 17, a strange, gigantic Cylon head is depicted apparently overseeing the prison on the basestar. 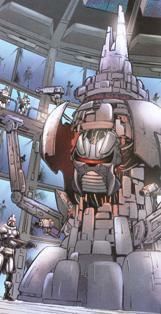 On page 19, notice that the human guerilla fighters wear pieces of Cylon parts as makeshift armor. On page 20, panel 1, Apollo is mistakenly drawn with his holster on his right hip; he is left-handed. Somehow, Apollo doesn't recognize the alternate Boomer, except that his voice sounds familiar (he's revealed as Boomer in the next issue, "Acts of Defiance")! This Boomer is unrecognizable just because he shaves his head? After bringing Apollo into the underground guerilla base to meet the boss, Boomer states that Apollo must be some kind of Cylon trick. But if he really thought that, would he bring Apollo to the base at all? He could be tagged with a tracking device if he was working for the Cylons! Of course, I suppose there could have been some kind of scan performed off-panel to check for such hidden devices. Why does the q-cache have a different numerical designation in the alternate timeline (7202 as opposed to 2702)? It's never explained in the course of the 5-issue story. I suppose it's just meant to indicate that things are a little different in this timeline, but it seems odd that it's merely a transposition of two numerals instead of a completely different number.